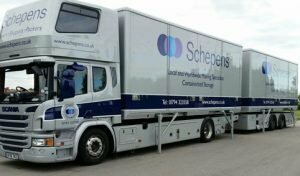 Schepens prides itself on its extensive knowledge of removals to Spain from UK and elsewhere, having successfully relocated families to all parts of Spain for many years. We currently have bases in Almeria, Alicante and Malaga. We use a fleet of dedicated articulated vehicles, which travel to Spain on a regular basis. These vehicles run on air ride suspension and boast an adjustable baring system, which ensures little or no movement of vehicle contents. These bars also enable us to create partitions between consignments which prevents cross contamination. Why use Schepens for removals to Spain? Schepens is a very experienced European house removals company that has been operating for over 100 years. We have the right combination of talented removers, modern equipment, and local knowledge to make removals to Spain simple. Schepens is a large company that moves thousands of tons of cargo each year. We have many storage depots and processing facilities throughout Europe. The large scale of our operation helps us provide a very efficient and affordable removals service to our clients. We also offer part load house removals to Spain, which can make your move even cheaper! Our removals are performed by uniformed removers trained to British Association of Removers (BAR) standards. Our adherence to these standards ensure your cargo will be handled professionally. Each remover has also been security checked. We choose workers who are friendly and have a strong work ethic — you will be delighted by how helpful they are. Our team helps clients move to Spain every week. We know the logistics involved when performing removals to Spain — which helps us provide very reliable and safe moves. The frequency of our removals to Spain also means we can offer clients flexible delivery schedules. Schepens offers clients an optional professional packing service. If you use this service, our skilled removers will pack up your smaller items for you, including cutlery, crockery, and electronics. Because your possessions will be packed by professionals, you can be confident that they are adequately protected for the journey. We provide all of the packing materials required when you use this service, including high-quality packing boxes. We work with a number of reputable insurance firms to provide clients with numerous cargo insurance options. You will be able to choose the perfect plan for your cargo and budget. We have established ourselves as the leading provider of removals to Spain by consistently delivering a professional, reliable and cost-effective removals service. Please call 01794 323558 for your free no obligation quote on removals to Spain! We are a 4th generation, family-owned business that places a great deal of emphasis on customer service. 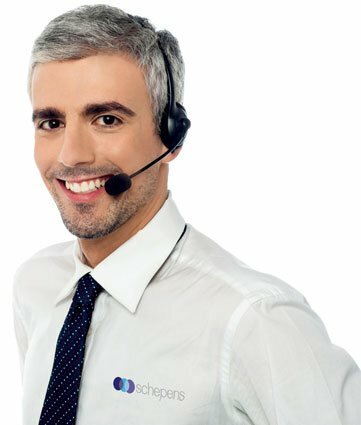 At Schepens, we treat our customers as if they were family members — with a great deal of respect, care and attention. Schepens frequently perform removals to Spain, which allows us to provide extremely cost-effective rates for our services. Our movers are highly experienced with the logistics involved when moving to Spain from the UK and can make your move simple, easy and stress-free. Schepens perform thousands of removals to Europe each year. Because we have so much freight moving around Europe, we have established a number of depots and storage facilities. We offer value-for-money storage services which gives you additional flexibility when you are organising your move. Our storage facilities are very secure and insurance is available. Many clients who are moving to Spain from the UK use our professional packing service. This service gives our clients peace of mind that their valuable possessions are packed appropriately for the long journey. Our movers have performed hundreds of removals to Spain and understand the stresses that freight may be placed under while in transit. This valuable knowledge helps them understand how fragile possessions should be packed. Our professional movers only use high quality, durable packing materials. Because we have performed countless removals to Spain, we understand all of the applicable customs rules and import duties. Our move co-ordinators can help you understand and complete any paperwork that you are presented with when moving to Spain from the UK. Schepens have comprehensive insurance on all vehicles and staff members who perform removals to Europe. We also offer a range of cost-effective insurance plans for your possessions. Clients have the option of taking out extended liability insurance, which will cover any incidences that involve your possessions injuring a person or property. Schepens only use insurance plans from reputable insurance providers. Because we have established a strong relationship with these insurance companies, our clients get to enjoy some great discounts. If an accident does occur while your possessions are moving to Spain from the UK, Schepens will lodge the claim and take care of all related paperwork — you won’t have to go through the hassle of dealing with the insurance company. Schepens have shipping options available to suit clients with vastly different requirements. From clients performing a full house removal to clients with a couple of small boxes — we have got you covered. All removals to Spain from the UK have the option of exclusive loads or shared loads. An exclusive load allows the client to use the entire container or truck as they see fit, while a shared load combines freight costs with other clients. You can choose the option which matches the amount of freight they have and your removals budget. Our movers have helped many music lovers move to Spain over the years. Our staff are highly experienced piano movers who understand the fragility of these expensive musical instruments. Before moving a piano, we will evaluate its condition and construction to determine if special precautions need to be taken. Then, using the appropriate equipment and materials, we will carefully ship it to the destination location. We are also very experienced with storing pianos for long periods and can make sure your precious musical instrument stays in top condition while in storage. Schepens provide removals to Spain using a wide range of transit options including air, road and sea transit. We can help you decide upon the best transit option to match your schedule and budget. Here are some quick tips for clients moving to Spain from UK. Before moving to Spain, you should audit your possessions to ensure you are only taking valuable and essential items with you. There is no point paying more to transport boxes of items which you rarely use or no longer need! Sell, give away or donate any items that you no longer need. If you haven’t used an item in a year, that’s usually a sign that you don’t really need it anymore! Get the utilities connected well in advance of your move date. You don’t want to face delays caused by your new home not being ready to move into. The bureaucracy in Spain moves slower than the one in the UK, so lodge any forms as early as possible. Keep any essential items with you during the move — don’t pack them into a box and forget where you placed them! Some useful items may include medications, favourite children’s toys, baby food and I.D papers. Both the UK government and Spanish government have a variety of web resources to help you transition between the two countries. You may need to learn about visa regulations, residency requirements, work requirements and taxation rules. The websites (listed below) can be extremely helping when moving to Spain from the UK. 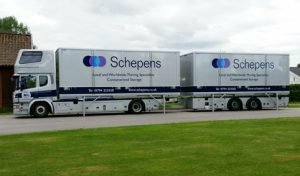 Schepens have a long history in the removals industry and are proud of the business that we have built. We are a 4th generation, family run company that has been performing removals to Europe for more than 100-years. Our family moved from Belgium to the UK in the late 20th-Century and began to make high quality furniture. The removals side of our business began to take off after World War II and since then we have helped countless families move around the world. We have a long history of providing removals to Spain and we would love to help you and your family move to this beautiful country. Our professional move co-ordinators will help you choose the right plan for moving your items and answer any questions you may have about removals to Spain. During the day of the move, they will keep you informed of the entire process. Schepens adheres to this code of practice very closely and all of our movers are trained to BAR standards. We have helped thousands of people move to Spain in the past 100-years. Our movers have detailed knowledge of the logistics involved when moving to Spain from the UK — we can make the move fast, simple and hassle-free. Because we are providing removals to Spain on a regular basis, we can offer discounted rates. Let our move co-ordinators help you negotiate the challenges of the Spanish bureaucracy and customs. They will help make your move to Spain hassle-free and easy! Schepens take a great deal of pride in the reputation that we have built up over the last 100-plus years. We take customer service very seriously and will do whatever it takes to make your move easy. All of our removals trucks are modern, clean and specifically designed to move freight for long distances. Our removals trucks have air ride suspension to reduce the stress on cargo. They also have a barring system to reduce cargo movement during the journey. We provide 100% free quotes for all clients interesting in moving to Spain. The beauty of Spain has to be seen to be believed! The beaches are incredible and there are many national parks to explore. Spanish citizens also get to enjoy incredible cafes, art galleries, restaurants, nightclubs, and museums. The Spanish people are friendly, so it is easy to make friends. There are also many community events and festivals held throughout Spain each year, which makes life in Spain even better! The Spanish economy was hit hard by the Global Financial Crisis, but is now bouncing back stronger than ever. Many businesses are moving to Spain to take advantage of the low operating costs and high-skill labour force. The most successful industries in Spain include agriculture, tourism, energy production, transportation, science technology, and professional services. There are many excellent transit links to Spain, so it is easy to explore the rest of Europe. You can jump on a train, plane, or boat to head back to the UK for a quick visit at any time. You will also find yourself having day trips into Morocco, Portugal, and France. The Spanish government understand the importance of education to their economy. They have invested heavily in the education sector which has driven remarkable improvements to education standards. Spanish schools now deliver education outcomes at a similar level to schools in the UK. Here are some helpful resources that will make your move to Spain easier. WHY ARE SCHEPENS THE BEST HOUSE MOVERS TO SPAIN? Our team helps clients move to Spain every week. We know the logistics involved when performing Spain removals — which helps us provide very reliable and safe house removals to Spain. The frequency of our European removals to Spain also means we can offer clients flexible delivery schedules. We are one of the most experienced Spain removalists in the UK! We are very proud of the company we have built, which is why we always provide the very best customer service possible. Our company works with a number of reputable insurance firms to provide clients with numerous cargo insurance options. You will be able to choose the perfect plan for your cargo and budget. Country, townhouse and villa properties for sale in the Axarquia region of the Costa del Sol in southern Spain. We offer help with relocating to Spain, building management, after sales service, car hire, and a professional, friendly and honest service. Remember good service does not happen by mistake. Whenarewethere.com provides villa rental in Spain, villas for sale in Spain, golf rentals Spain, Portugal villa rental, Portugal apartment rental, Switzerland vacation rentals and Switzerland apartment rentals. Best vacation rentals and holiday rentals in Spain, Los Arqueros, Golf and Country Club, Puerto Banus, Costa Del Sol, Marbella, Portugal, Vale do Lobo, Switzerland, Verbier. Villas Espagnolas offers golf villas,golf holiday packages, golf holidays Spain, luxury villas Spain, property rental, villa maintenance, property maintenance and property management. Best property rental and holiday villas in Spain. Property For Sale Spain – PGM are a family run real estate agent offering resale and off plan properties for sale on the Costa del Sol and other regions of Spain and Europe. Mallorca Property Finder – Property finding service for Mallorca, Spain. Spain continues to be a popular destination for migrants from the United Kingdom. It’s no wonder! It is a beautiful country known for its stunning environment and lovely warm weather. Spain also has one of the most vibrant cultures on the planet and a very high standard of living. Moving to Spain can be difficult if you organise all of the logistics yourself. Thankfully, Schepens is available to make the removals process simple! Our family-owned company has performed thousands of furniture removals to Spain since we began operating, more than 100 years ago. Our removals to Spain are performed with a strong focus on safety, reliability and efficiency. All removers are trained to British Association of Removers standards (BAR), the industry’s leading standard for professional removals. This means you can be certain that your cargo will be handled correctly throughout the journey. This article will explain how Schepens perform furniture removals to Spain. After our brief overview of our Spain removals, we’ll share a few reasons to choose Schepens. Schepens is one of the most experienced European furniture removals companies in the world. We have created a detailed approach for our removals which ensures the safety of your cargo and reliability of the removal. Whereabouts in Spain is the cargo headed? How much cargo will be moved? Is any of the cargo particularly fragile, large or heavy? Are there any access issues at either location? Would you like to use the Schepens professional packing service? Would you like to use our storage service? Our move coordinator might need to ask questions about specific pieces of furniture, to help us move them safely and efficiently. They will also ask you about the cargo insurance option you prefer to use. Our quotes are simple to understand and 100% free. They are also obligation free! The total cost listed in the quote is the door-to-door price. Our prices are very competitive and there are no hidden extras. Any fragile surfaces like soft timber are covered with corrugated cardboard or moving blankets. This ensures no scratches occur during the journey. Some pieces of furniture may be disassembled if it improves the safety or efficiency of your removal. Very fragile items, mirrors and glass pieces are carefully wrapped in bubble wrap. The edges of mirrors are covered with cardboard to prevent chipping. If you have decided to use the Schepens packing service, we will also box up your smaller possessions including crockery, cutlery, and glasses. WHY CHOOSE SCHEPENS FOR FURNITURE REMOVALS TO SPAIN? We are one of the biggest European furniture removals companiesservicing Spain. The size of our operation means we can obtain business efficiencies better than our competitors. We also have more negotiating power when dealing with suppliers. This all combines to make us a very affordable option for Spain removals. Our company is proudly family owned and has been in operation for more than 100 years. Our longevity is due to the excellent customer service that we provide. Every client is treated with respect and appreciation by our team. We help hundreds of clients moving to Spain each year. We know the logistics of the journey well and will ensure your Spain removal goes off without a hitch! We use move coordinators who are highly experienced at performing European furniture removals. They understand the potential problems involved when transporting cargo for long distances and are prepared for any eventuality. If you need removals to Spain, then Schepens has the experience, expertise and local knowledge to offer you a smooth, trouble-free move.